Here's my finished wool applique piece designed by Buttermilk Basin and was in the current winter issue of Primitive Quilts and Projects. The next few photos I found and had not posted yet. They were kind gifts sent to me recently. Thank you all so much!! Hmmm, wonder where this could be from? beautiful! Some of you saw this on Facebook. While I was finishing dinner preparations I was called out to the living room and met with THIS! LOL I love my family's sense of humor! I couldn't resist this photo op of my hubby and brother tying on the apron. A little after dinner fun! So much for no snow. It may be a more quiet Thanksgiving than I would like, but I'm still thankful for so many blessings. Thank you all who read and comment on my humble little blog. 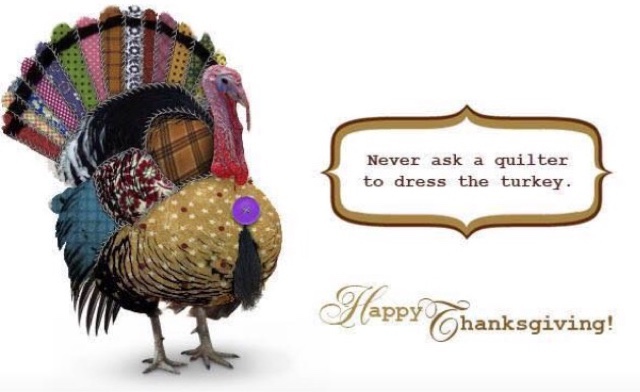 I'm very grateful for the fun I can have stitching, quilting and sharing with you all! Below is the link to a Bolivia video I made to show in church on Sunday. You may have seen the link already on facebook. Feel no obligation to watch. I just thought some of you may be interested. It was a cold and foggy day most of the day on Sunday. Good day to stay in and prep a little stitching and clean house before the holidays. I found this cute free primitive pattern on Notforgotten Farms. I had this great piece of Moda toweling that is perfect for stitching on. Check it out HERE. I usually find these in the remnant section of Fabric Depot and seriously pick them up for a few cents. They are seamed on both sides and I just trim it even and sew a small hem and use them as napkins or towels, depending on the size. After looking at the finished piece I realized I needed to add a few needles to my feather tree. I think it looks better. I started this cute piece this weekend too,. It was in the latest issue of Primitive Quilts and Projects and was designed by Buttermilk Basin. It looks like winter has shown up for several of you. We may get a little snow later in the week. I hope it is after Thanksgiving so my kids will be able to make it home. Quiltworks First Friday was showcasing a variety of small quilts. Here are the ones I liked the best. I loved the background fabric on this one. What great texture! Close up of the boat in the above quilt. Simple up close, but super effective in the quilt overall. This was miniature- super tiny! A wool piece- patriotic- my fav! By Kristen Sheilds, started in a class with Bumble Beans, Victoria Findlay Wolfe. I don['t "do" modern, but greatly admire both of these quilters. Thank you for all the offers of flannel. I was able to get some today and it should be enough to finish the top. I gave my daughter a flannel quilt I made years ago in a mystery class and she told me recently it is getting thin and she needs a new winter quilt. This is what I started on this week. A simple pattern that is bound to be warm. The problem is I don't have much flannel. Saturday was the Stitchin' posts yearly PJ sale. The earlier you get there, the better the discount. Wear your PJ's get 5% more off. I actually stopped so we could take photos of this amazing sunrise! It's good to see snow on the mountains after such a dry summer. If you look in the background you can see pajama clad shoppers. It's busy but everyone is pleasant. And you'll never know who you will run into. Here's Anna from Woolie Mammoth. I had a fun morning, but unfortunately I didn't find too many flannels! Thanks for all the sweet comments you leave on my blog. I read and treasure every one of them, although I'm not able to respond personally to them all. Happy Monday! I think I'm really on the mend. I made it to church yesterday and then hubby and I left town for a date. I did have to leave mid-way through the movie cause I got a crazy cough that wouldn't stop, but we had fun anyway. I wanted to share a few photos about my mission trip to Santa Cruz de la Sierra, Bolivia. If you have been reading my blog long, you may remember my trip to Guatemala. MSI uses the same format for each city they go to. My experience this time was so much different than my trip last year, partly due to the sheer population of the city we were in. This year I was asked to be a team leader, which I accepted. I had no idea we'd be speaking to schools with hundreds of kids! It was a little frightening, but also challenging and exciting! We did make it to a few smaller schools/daycares which were perfect for handing out dresses, clothing, food and school supplies. Most of the schools we went to, like this one, were public schools, that had these massive courtyards with classrooms upstairs. We went to many of them and they were all built the same. School is mandatory and these kids pay about $5 month to go. Most public schools in Santa Cruz do not provide a good education. Depending on the number and age of kids and the time we had, we did a drama presentation about how the world pulls on us with many things that lead us down the wrong path, the wordless book in shirts and personal stories about how Jesus has transformed our lives. The bottom line is we offer them hope when their future may look very hopeless. As team leader it was up to me to decide what we would present and who would present it. This is a pretty typical front door to a school, that is kept locked. Here was the team I had assigned to me. There were 11 total serve team , one guide (who knew the city and was the contact for the schools) and 3 interpreters. See the school to the left with the wire? Our guide was seeing if they were ready for us. We also went to some private schools. These cost the families about $50 month to attend, which is a huge sacrifice. Looking at that may kids was intimidating! They were all pretty well behaved and listened intently. We also handed out flyers for the 2 night free festival, which I can only say is very similar to a Billy Graham crusade with rock music! Even security guards were invited! Typical scene in the city. This kid reminded me of Zacchaeus in the tree Bible story. He just wanted to get a good view! We went to a village a ways away from the city. It was so hot and the sand, like beach sand, was blowing like crazy. Despite the weather, I loved this stop! The younger kids walk 30 minutes to school and the some of the older kids walk 1 hour! Can you imagine? Look closely to the right of the photo along the grass and you'll see a lizard of some type, about 2-3 feet long! We also had the honor of raising money for a much needed well for a school and community. We partnered with Bridges of Hope to make this a reality. We take so much for granted, including water! I'm so thankful for the great water I drink just by opening my faucet. 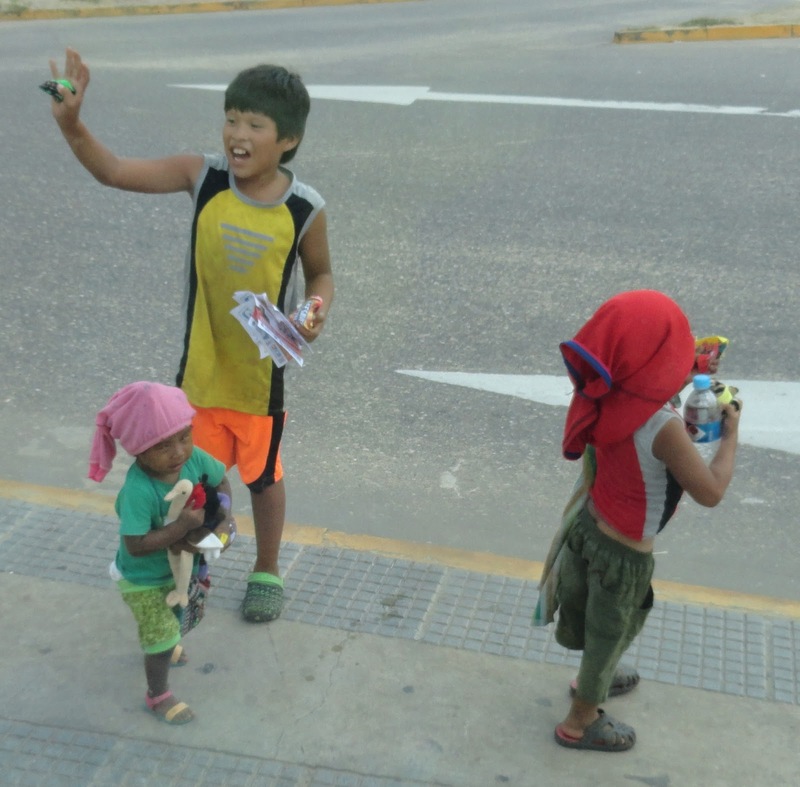 We were leaving for the sandy village and we saw these two kids on the meridian of a busy highway begging. One in our group was trying to get the window open so we could hand them something from the van, but the light turned green and we moved on. Not even one minute later I got a phone call to return to the hotel to pick up some more things. It was then we realized we would be going by these precious children again! We were ready for them. Here they are with hands full after our second drive by! it wasn't much, but it was something. Thanks for your support, financially and morally and all your kind words of encouragement. I look forward to be used again next September!